People were standing on bins and benches to get a better view of court eight at Flushing Meadows last Friday as some menacing dark clouds threatened to interrupt the US Open's final round of qualifying. 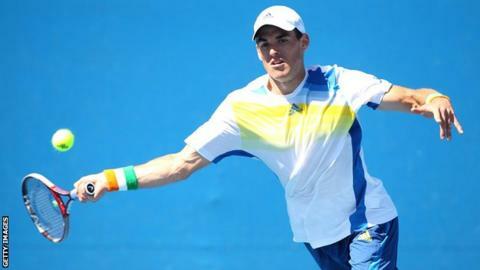 Several hundred spectators had been drawn to a match between Zhang Ze of China and Ireland's James McGee, who in a seven-year career had never before qualified for a Grand Slam. The 27-year-old Dubliner had already had one chance to serve for the match and cramp was threatening to prevent him fulfilling the ambition of a lifetime. "I somehow summoned up enough energy and willpower to hit two aces at the very end of the match," he said. "It was sort of my only option because I wasn't able to run." New York's Irish ex-pat community joined in the celebrations as McGee took great delight in signing dozens of balls and programmes thrust in front of him. "I've never burst into tears of happiness but I fell on my knees and immediately started crying like a big baby," said the Irishman as he reflected on securing his place in the main draw on his fifth match point. "I felt like I was releasing a lot of pent-up emotion from years of hard work, frustration and sacrifice. I feel like there's a big weight lifted off my shoulders." McGee will move to court 13 on Monday afternoon to play Aleksandr Nedovyesov, another player who knows what a struggle it can be to make ends meet. First-round losers take home just over $35,000 (£21,000), which is more than a quarter of what McGee has made in his entire career. "I was basically losing money on a weekly basis for years upon years," he explained. "I was staying in hostels and flying on low-budget airlines. Every match you play, you're playing for your dinner or your breakfast." Without the financial support offered a few years ago by Castleknock Lawn Tennis Club in Dublin, McGee would probably be elsewhere this week. That money kept him afloat, and he has since been able to attract sponsors by writing about his experiences in a blog. He hopes to invest the prize money earned in New York in a coach; he currently works with the former American top 100 player Jeff Salzenstein, but can only afford to be with him for between three and five weeks a year. McGee is ranked 194 in the world, having broken into the top 200 for the first time last month. There have been some memorable performances for Ireland in Davis Cup along the way, and he has also won four tournaments on the third-tier Futures circuit. The most recent of those came in Gabon exactly 12 months ago. "I don't know Rory McIlroy and I don't really know Andy [Murray]. I follow both of them on Twitter..."
"Gabon was very, very different to New York," he said, smiling. "After the match, they were handing me finger food. I had probably shaken 200 hands and I must have had some sort of bacteria on my hand. "The next morning I literally could not get out of bed. I was vomiting and all the worst things you could possibly imagine and I was stuck in bed for two days. "I ended up flying back to Ireland, getting all sorts of tests done, going to tropical disease centres. I found out after a good few weeks that I had some sort of parasite within me." McGee's mother, father and sister have flown out to watch his first-round match and the genial McGee has also been touched by messages of congratulations from other players. He is friendly with Wimbledon quarter-finalist Nick Kyrgios and has practised with 14-time Grand Slam champion Rafael Nadal, but does not claim to know the top players from any sport at all well. "I don't know Rory McIlroy and I don't really know Andy [Murray]. I think I shook hands with him once, and I follow both of them on Twitter, so that's sort of the closest I get." McGee's locker is right next to Murray's at Flushing Meadows this week, so expect that to change. Just as so much already has in the space of just a few days.